I’m finally ready to share my gallery wall with you! It’s still a work in progress, but for now I LOVE it! Nothing really wrong with it…but I never really loved it. 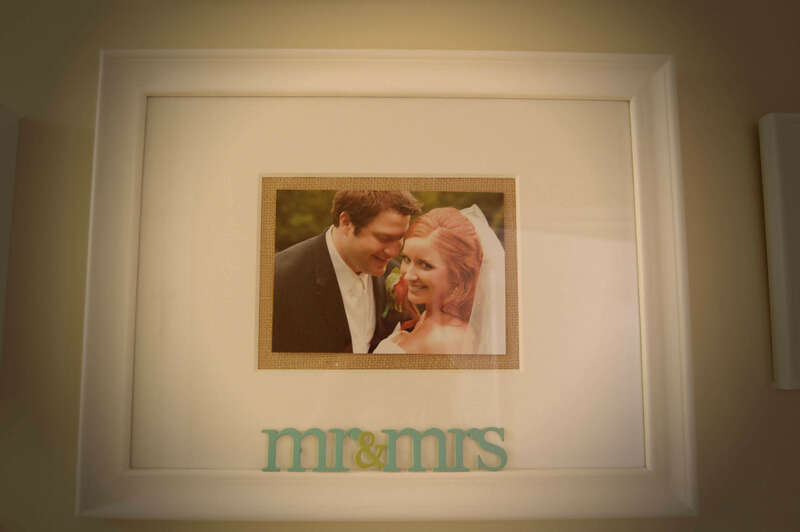 I didn’t like that large black frame with all the wedding photos in it…and I was sick of black frames. Our house is filled with black frames. Plus this gallery didn’t really use the space properly. So, to begin I took all of the frames down and nails out. I have been gathering frames up for a long time to use on this project. I then made a paper template to fit the size of each frame I was planning to use. I thought this would take forever but really it was surprisingly fast! 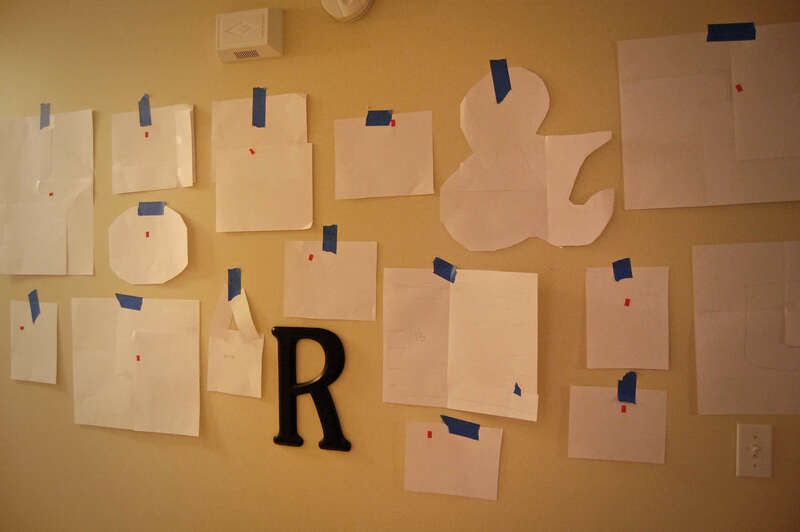 The paper templates made it is SO easy to move the “frames” around and play with the layout. I just used painters tape and experimented with different layouts until I found one that I liked. I had two goals: 1. to try to cover up all of the previously existing nails holes with a new frame so I wouldn’t have to patch and re-paint and 2. to keep the “R” where it originally was. It was a pain to put up and I didn’t want to mess with it again! I also numbered each frame and then put the corresponding number on the template so that I wouldn’t confuse which frame belonged where. Then, once I had decided on my layout I placed the template against the frame and used a pen to mark where the nail should go. I did each frame one by one, making sure to tape it back on the wall in the correct place. Then I simply put a nail over each mark. SO easy and it requires zero guess work and measuring! Then I hung the frames! You can see I used some old frames mixed with some new. Seeing this picture makes me sort of like the mix of black with white frames. The wall looked like this for several days while I tried to decide if I liked the “mix” or if I wanted to stick to my original plan and paint all of the frames white. My mom voted to keep the mix. My husband didn’t care. So I figured I might as well paint everything white…it is an easy switch back to black if I change my mind down the road. And here it is! I added two frames into the layout last minute. And I kept the “R” black…but am still on the fence about what color it should be. I kind of like it in black. And the view from our front door. One of my favorite wedding photos didn’t fit in the mat I purchased so I improvised by backing it in burlap! I’ve always wanted to display this photo of baby Wrigley, taken by our wedding photographers the year after our wedding. And I just had to use the cat print on the top right. I purchased it after Pancake died because it looked so much like him and Henry. I’m so glad it finally has a place on our wall! And that old postcard is from Long Beach, where I grew up. It was my mom’s (and so was the frame!) and I told her I really liked it so she gave it to me. She’s the best. Erin and I found that ampersand at Hobby Lobby. It was painted rusty red and had a base to stand it upright…so we talked the husband in to sawing it off for us and then we painted it white and roughed it up a bit. 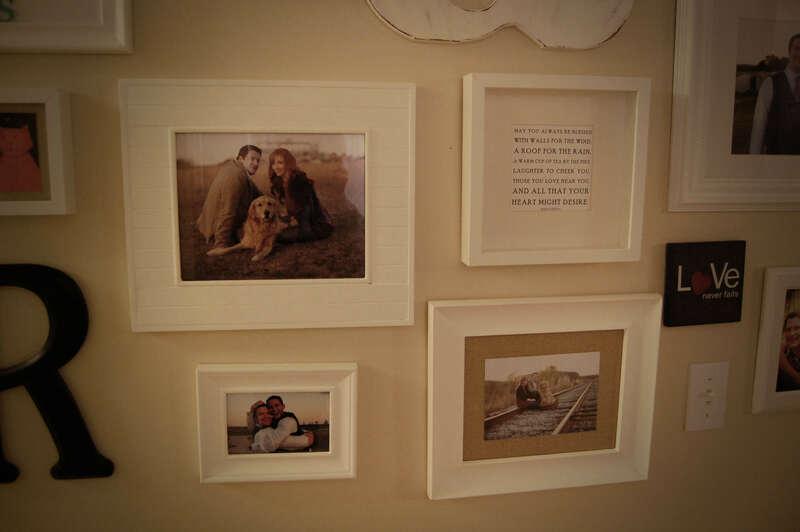 It can be seen in the annual photos she took of us for this gallery wall and for our Christmas cards! I love the mix of photos and non-photos. This is just a greeting card my mom and I found that I fell in love with one day while shopping. Top left and bottom right photos were taken by Erin and I love them! The bottom right is also backed in burlap. I’m so happy with how it turned out. 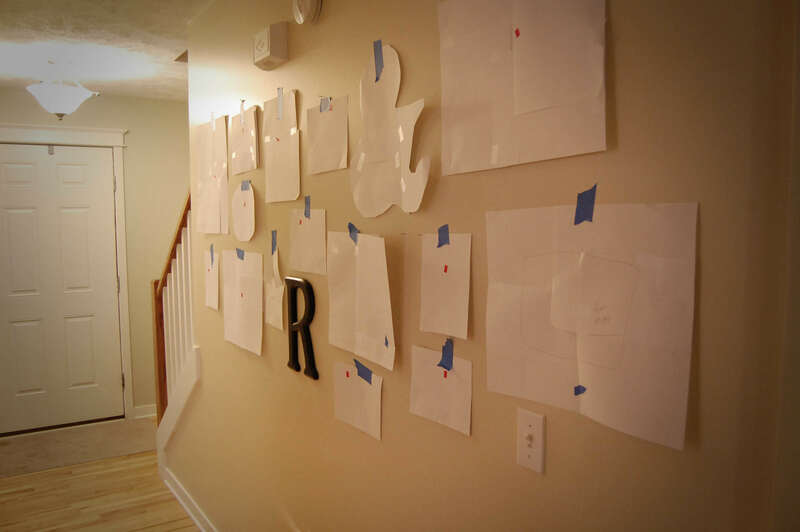 Now I want to make another one going up the stairs….eventually I’ll get to it! p.s. I’m just know noticing there are a ton of photos of Wrigley on this wall. No, we are not crazy dog people….he’s just so photogenic and we don’t have kids, so why not? p.s. your doggy is too cute!! I had an idea while looking at it..I do like the black R since it stands out but you could also spraypaint it a blue color to match the blue "mrandmrs" color in that frame? Then you'd have some color on the wall! just an idea. I love it how it is though too!! 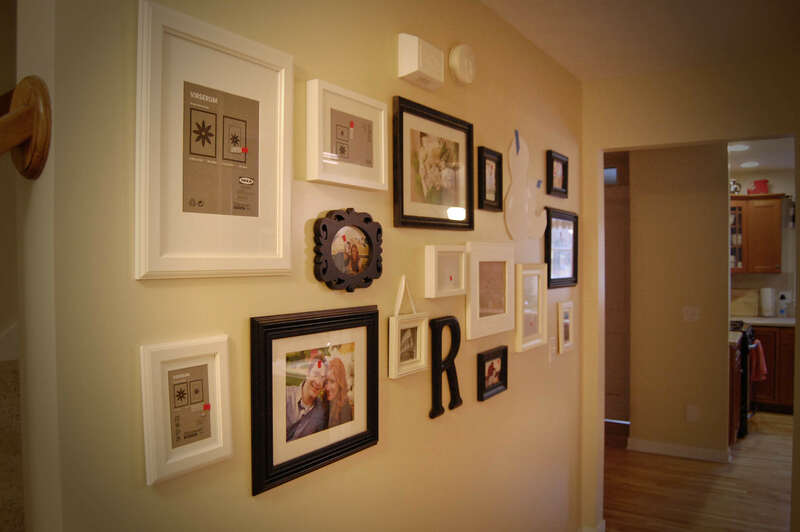 Your wall looks great! thanks for giving the step-by-step, it definitely looks "doable" now. I love all the photos of Wrigley! He's a part of your fam, it's only fair he's included! Great job Julie! I love the way it looks, and I wish I could find that same ampersand. And that greeting card almost brought me tears… Perfectly Done! It looks amazing!!! You did such a good job! I love it!! WOW!! I LOVE it!!! You did an AWESOME job!! I need you and Erin to come here and help me!! i LOVE IT!!! and i LOVE the backing with burlap, genius!! 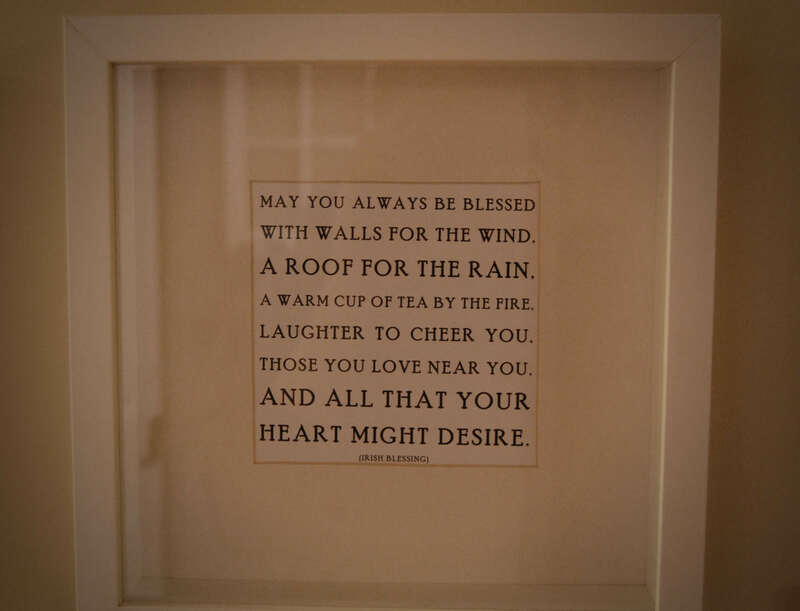 This is just lovely! I'm obsessed… and am going to attempt to replicate asap 🙂 Fabulous! Looks so good! 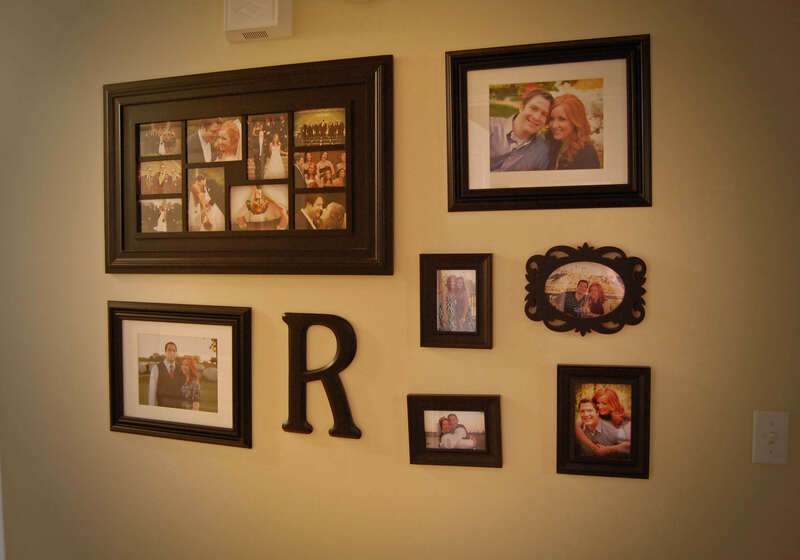 I did the same thing with the wall that our tv is on in our living room, and I LOVE it! Such a cute and sassy way to spice up any wall! 🙂 Happy Tuesday! It looks amazing! I have been wanting to do a gallery wall for a while now, I'm just not sure where I am going to do it. I am loving your wall!!! I have a huge wall behind my loveseat that I am hoping to fill with something like that! Thanks for the inspiration! Seriously looks soooo good!!! 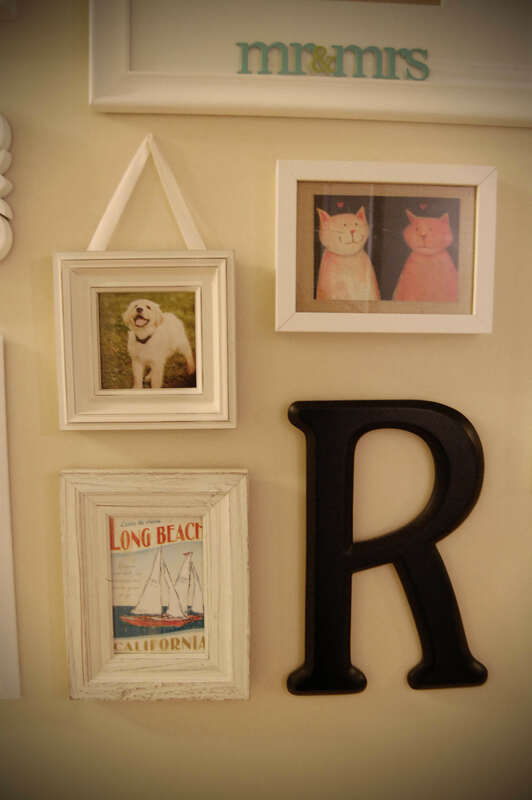 I love the white frames against your paint color! Love it! Looks beautiful! 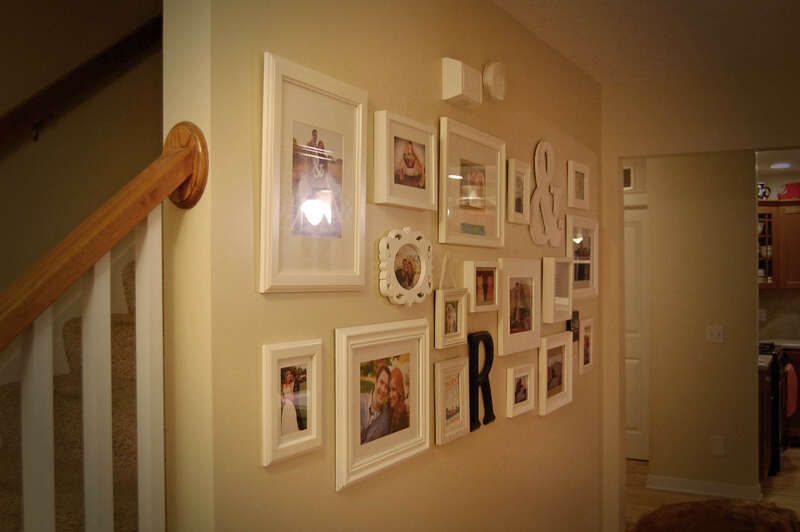 I've been struggling with a gallery wall for my stairwell and now having seen your finished product I think I definitely need to make it happen! Love it!! 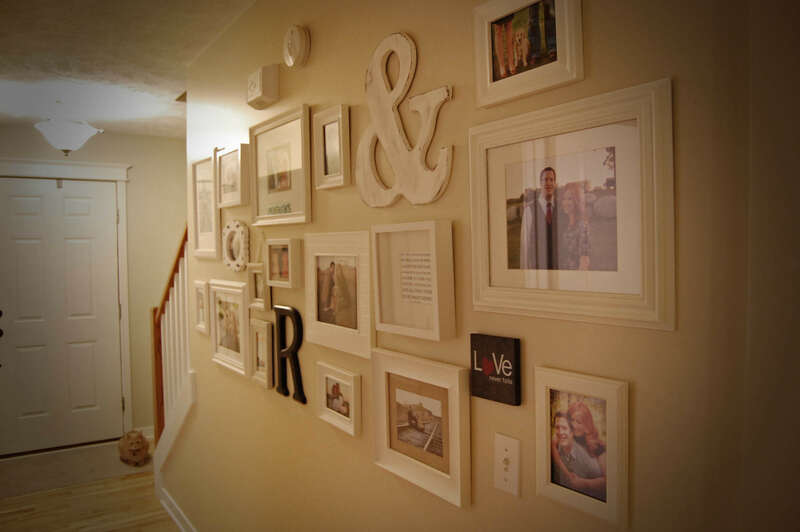 I'm working on gathering frames to do something similar to my living room wall. I love it! Love the mix of photos and art! I like the all white or mixed colors, too! You did a great job. We've been working on ours forever, b/c we aren't organized at all and just freehand it. We finally finished one set of stairs almost a month ago, and three totes of frames still sit in my living room waiting to be hung! Sigh! 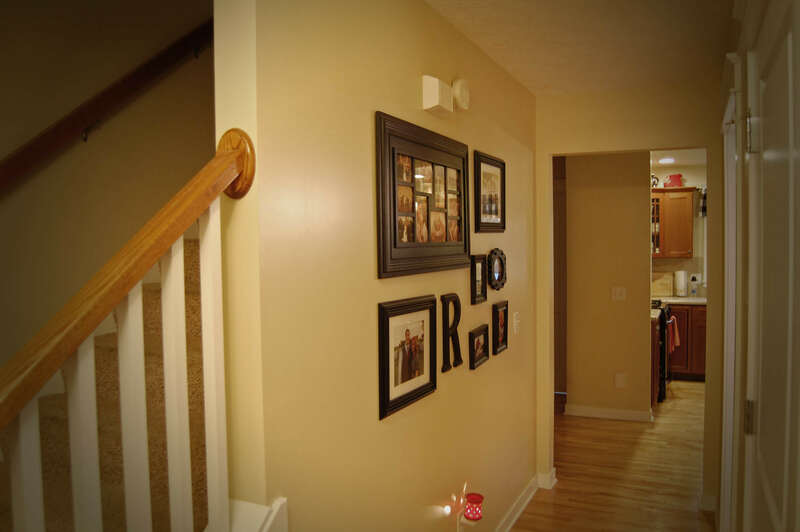 Love your finished product – a great collection! 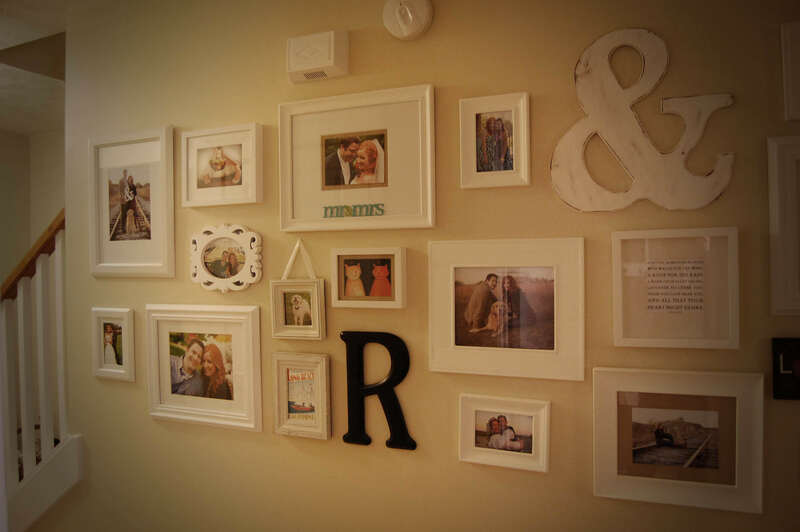 I think there will be ALOT of people completing a gallery wall now! Thanks for all the tips and it looks amazing! This turned out great! Can you come decorate my house pleaseeee?! IN LOVE!! So cute!! It turned out really well!! I just did this is my bedroom a couple weeks ago!! Way cute!! I am obsessed and It turned out so fantastic. The wall looks great, nice work! It look so great! Very nice job. You gallery wall looks great!!! 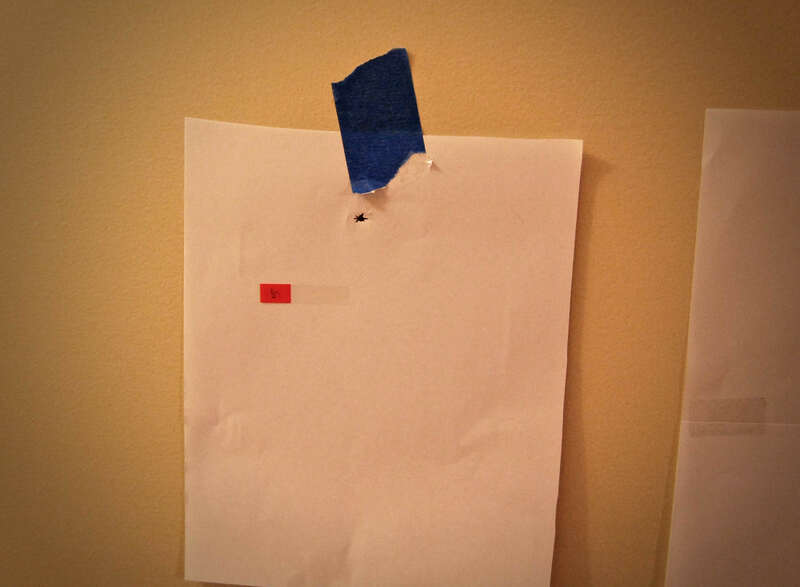 That's a great idea of using the paper to lay it out. Looks so good, Julie! I do like the little pops of black. And I was just thinking earlier today if I was one of those crazy dog ladies because I want to get like paintings of Brady and put them around the house ha! Oh my GOSH! You are GOOOOOOOD girlfriend!! Way to go! Looks AH-MAZING!! 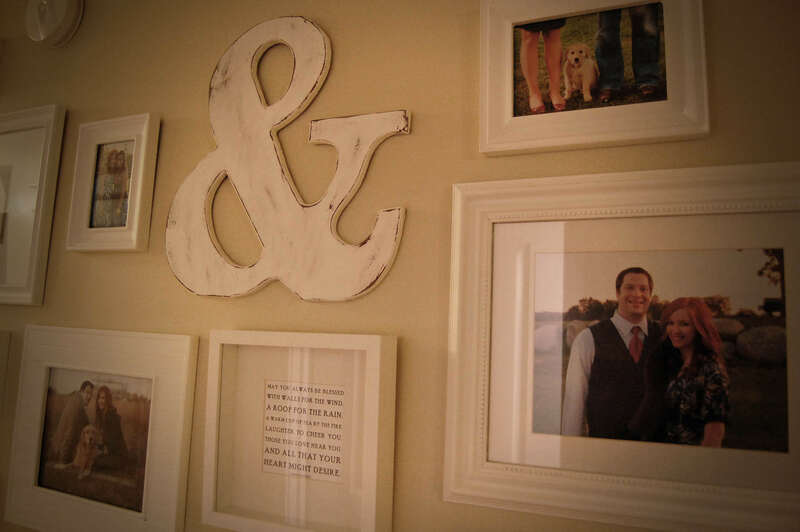 Love the ampersand! Oh-and of course the bajillion photos of Wrigley!…he just might be THE most photogenic dog…like EVER! 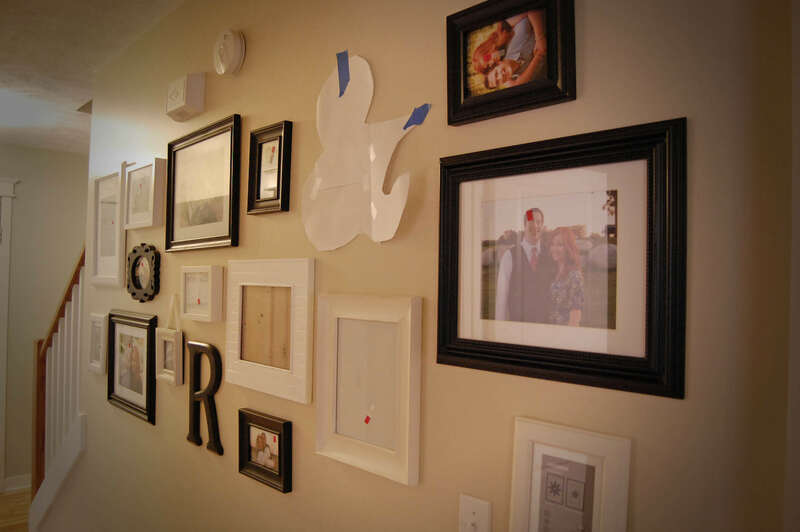 I LOVE the gallery wall. If you want to change the "R" color you could always paint it red!!! Or charcoal. that looks so great! love it! You did a fabulous job. I love it. Might have to re vamp the one at our house!